Felecia and David were married at Innisbrook Resort and Golf Course in Palm Harbor, FL in late October. The team at Innisbrook led by Rick Galipault did an amazing job and provided a first class experience for the bride and groom, vendors, and the guests. The ceremony took place at the tranquil Salamander Spa Area complete with oversized gazebo and seating area. We couldn’t have asked for better October weather with a slight chill in the air to keep everyone cool during the outdoor ceremony. Tammy Lackore with True Love photography was a pleasure to work with, maneuvering around the ceremony to capture many fantastic moments for the couple. The couple worked alongside Brian Jones of Sensational Ceremonies to create a custom ceremony to perfectly fit their love story. 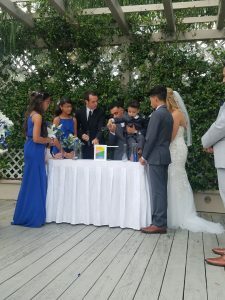 A personal favorite moment was performing the Unity Sand ceremony for their family of 7! It’s amazing to see families unified during this special wedding celebration!